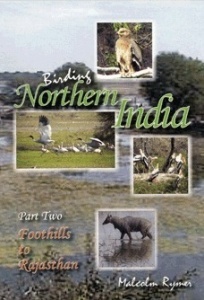 In this DVD, Birding Northern India - Part 2, the companion film to 'Corbett, Koshi & Beyond', we continue our birding adventures, travelling deeper into Uttarakhand in pursuit of the region's special birds & wildlife. We pick-up our explorations from our base at Pangot in the highlands of the Himalayan foothills. From birding these spectacular landscapes we travel via picturesque wooded valleys to Sat Tal, adding several notable sightings to our experiences - steppe eagles, three species of forktails, bulbuls, buntings, an accentor, bushchats the red-billed blue magpie & the like. From Sat Tal we travel & bird en route for a couple of days heading south into the state of Uttar Pradesh. After birding the Chambal River region we move westards towards Agra, take in the architectural splendours of the Taj Mahal before continuing to Bharatpur in Rajasthan. Keoladeo Ghana Reserve in Bharatpur is a world renowned wetland notable for harbouring many thousands of overwintering ducks, geese & up to sixteen species of breeding waterbirds. The birdlife on view, after good monsoon rains, is unparalled anywhere in the world - cranes, storks, spoonbills, ibis, herons, egrets, cormorants & darters. Our special sightings feature the endangered black-necked stork, sarus cranes, the sheer numbers of over-wintering waterfowl, eagles, hundreds of painted storks, dusky eagle owl, white-tailed lapwing, etc. Filmed & Edited using the latest digital technology.